A third-person action game focusing on cooperative gameplay. It was developed by the Polish division of Epic Games (formerly known as People Can Fly). The action of Fortnite takes place in a world haunted by zombie-like demons. Fortnite for PC, PS4 and XONE is a third-person action game based on free-to-play business model. It was developed by Epic Games, a company known mostly for such action games series as Gears of War and Unreal as well as creating the advanced Unreal Engine technology. Although the cooperative multiplayer is the key element of the gameplay, the story is fairly important. We are taken to a world haunted by zombie-looking demons that descend to Earth from the storm clouds located over the horizon using a network of portals. The players assume the role of the members of units tasked with guarding those gateways to make sure nothing comes out and to try to close them using a device called Atlas. The story is told in the span of several campaigns that take 10, 20 or 50 hours to complete, depending on the decisions made before they start. They are divided into randomly generated levels and are somewhat non-linear since, after completing each mission, we are given a choice of selecting the next location. Demons come only after a special device is activated, so the players have time to prepare accordingly for the action. They have to assess the defensive potential of a quite vast environment and then erect fortifications that will help to repel the monster invasion. There are three basic kinds of materials: wood, stone, and metal, all extracted from nearby sources (cars, for instance). Beside searching for resource deposits, exploration is also important because of the fact that it allows us to find new weapons and blueprints for more advanced equipment. Another important thing is that virtually entire environment is destructible — everything that protrudes from the ground can be utilized by the use of pickaxe and other tools. The players have almost complete freedom in designing their fortifications, and some of the most important elements of their stronghold are undoubtedly traps, such as electric floors, spikes, mines, automatic turrets or toxic gas clouds. However, in order to prevent the game from becoming too easy due to placing, for example, a machine gun at every corner, our enemies’ strength is adjusted accordingly to our defenses. 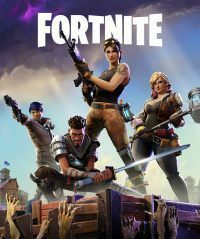 Since Fortnite is a cooperative game for PC, PS4 and XONE owners, player cooperation is an important element of the gameplay. Responsibilities are divided among the team members primarily on the basis of the chosen character class. There are several “professions” to choose from: Constructor (builds faster and uses less resources), Ninja (can perform double jumps as well as strong melee attacks with his katana), and Commando (classic soldier, a firearms specialist). What is more, each hero can be developed up to 20th experience level and thus gain more advanced abilities and skills. It is also worthy of notice that the player is given an HQ (observed in isometric view), which can be expanded with such facilities as armory, command center or hospital wing. Fortnite for PC, PS4 and XONE offers cartoonish graphics, similar to those of Team Fortress 2. Like every other title from this developer, Fortnite is powered by Unreal Engine.